Eastern junior Jess Parker (left) leads Wahama’s Elizabeth Mullins (22) and Hannah Rose (right) on a fast break, during the Lady Eagles’ 62-26 victory on Monday in Tuppers Plains, Ohio. WHS freshman Harley Roush (24) tries a two-pointer over EHS junior Kelsey Casto (32), during Wahama’s 36-point setback on Monday in Tuppers Plains, Ohio. TUPPERS PLAINS, Ohio — The difference was on defense. 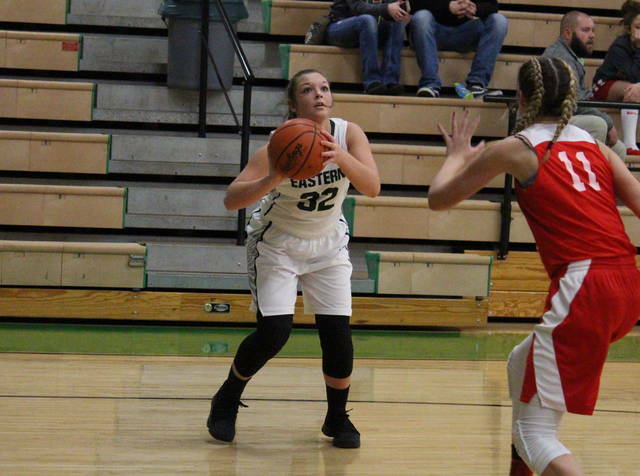 The Eastern girls basketball team forced 42 turnovers on Monday night at ‘The Nest’, as the Lady Eagles soared to a 62-26 victory over Tri-Valley Conference Hocking Division guest Wahama. Eastern (5-2, 4-1 TVC Hocking) — fresh off of its first league loss of the season —scored the first eight points of the of the contest and never trailed. The Lady Eagles shot over 50 percent from the field in the opening quarter and led the Lady Falcons (1-5, 0-5) by a 20-to-6 tally after eight minutes of play. The EHS offense cooled off in the second quarter, but the hosts still doubled-up Wahama in the period, extending the margin to 34-13 by halftime. Eastern claimed the first nine points of the second half and outscored the Lady Falcons by a 21-to-2 count in the third quarter, making the advantage 55-15 headed into the fourth. With all-5 EHS starters setting out the finale, Wahama closed the game with its best quarter of the night, outscoring the Lady Eagles by a 11-to-7 clip and making the final margin 62-26. Collectively, the Lady Eagles shot 26-of-62 (41.9 percent) from the field, including 2-of-9 (22.2 percent) from three-point range. Meanwhile, Wahama was 11-of-45 (24.4 percent) from the field, including 1-of-7 (14.3 percent) from deep. Both teams had trouble from the free throw line, EHS shooting 8-of-22 (36.4 percent) and WHS going 3-of-12 (25 percent). EHS won the rebounding battle by a 34-to-31 tally, including 16-to-14 on the offensive glass. Eastern also held advantages of 15-to-3 in assists and 31-to-8 in steals, while Wahama earned a 5-to-4 edge in blocked shots. 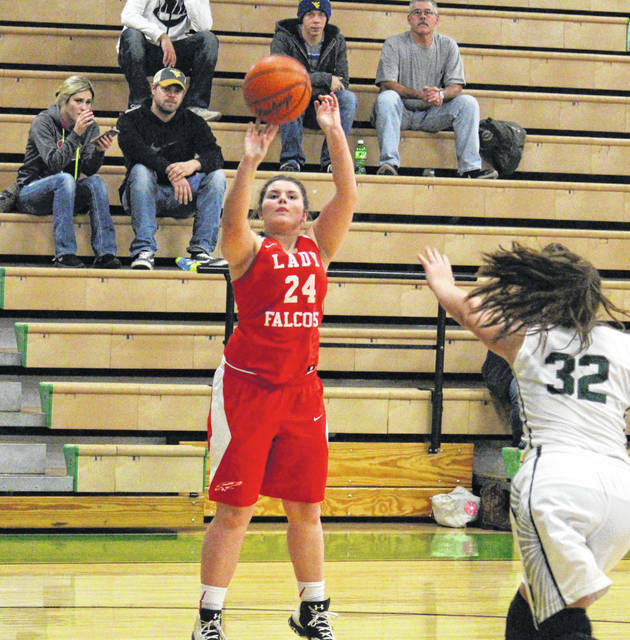 The Lady Eagles committed 19 turnovers in the win, 23 fewer than the Lady Falcons. The Lady Eagles were led by Jess Parker and Alyson Bailey with 11 points apiece, followed by Elizabeth Collins with nine and Madison Williams with seven. Parker and Williams drained a trifecta in the win. 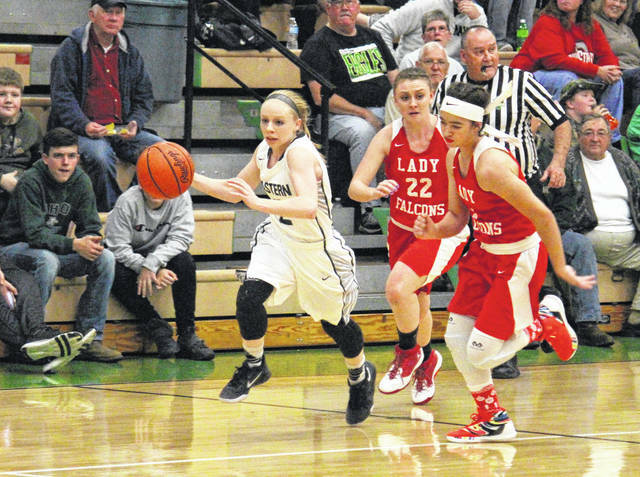 EHS freshman Kennadi Rockhold scored five points for the victors, while Ashton Guthrie, Kaitlyn Hawk, Whitney Durst and Kelsey Casto had four points apiece. Sydney Sanders and Maddie Nutter rounded out the team total with two points and one point respective. Sanders pulled in a team-best nine rebounds for Eastern, while Collins and Rockhold grabbed five each. Parker dished out a game-high four assists, while Williams led the defense with seven steals and a rejection. Gibbs led the Lady Falcons with a double-double effort of 10 points and 17 rebounds, to go with a game-high five blocked shots. Hannah Rose — who came up with a team-best three steals — made Wahama’s only three-pointer and wound up with nine points. Victoria VanMatre recorded four points and five rebounds in the setback, while Elizabeth Mullins scored two points. Harley Roush rounded out the WHS scoring with one point, while dishing out two assists. 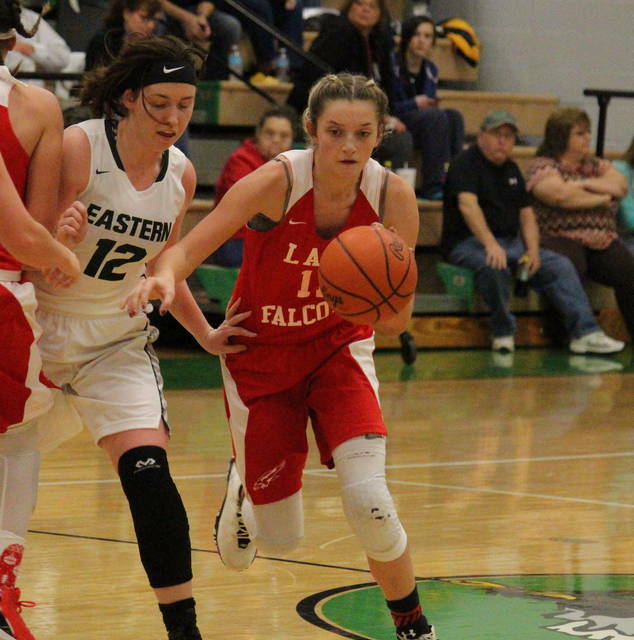 The Lady Falcons and Lady Eagles will clash again on Jan. 29 at WHS. Both teams continue league play on Thursday when Wahama hosts Trimble, and Eastern visits Federal Hocking.